Beat the egg whites with a small percentage of vanilla sugar until stiff peaks. Gradually add the rest of the sugar until the mixture is thick and glossy. Fold in the cornflour, vinegar and 50ml of the hot tea until just combined. Spread the mixture onto a paper-lined and well-greased tray. Bake at 170°C for 8–10 minutes until just set (slight colour). Turn out onto a piece of greaseproof paper lightly dusted with sugar. Infuse the loose tea in the cream overnight. Whip the cream to soft peak. Spread evenly over the Pavlova and sprinkle with the berries. 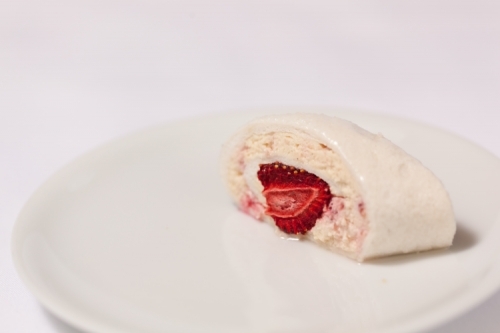 Using the greaseproof paper, roll the Pavlova (like a Swiss roll). Roll again in a dry tea towel. Set aside in the refrigerator for 1 hour. Dust with icing sugar and slice. Garnish with two pieces of strawberry on each side of the sliced pavlova.